There are many payoffs about being a healer. For one thing, I can do healing work on myself if and when I ever get sick or injured or when emotional or spiritual issues come up. For another thing, I have a lot of friends who are healers who are more than happy to care for me if I am not able to help myself. My friends who are healers take care of me and I take care of them during times of need. Just two days ago, two friends of mine who are healers worked with me to do distant healing on a mutual friend who is a healer in Canada. We have clients, of course, but people like us take care of each other. Our friend in Canada had sent me an email to ask for a specific healing. Her mother has three inoperable brain tumors, and my friend had moved her mother into her living room at her home on Lake Huron and had 20 people a day coming to pay their last respects. She wrote to me that she knew she was going into acute adrenal stress. My two friends from Atlanta and I got together, prayed for her, and did a distant healing on her behalf. She emailed me back the next day to say that she felt so grateful to have friends like us. This weekend was my turn. I had hurt my right shoulder in July. I had had six healings on it before this week, but I admit, I was still doing too much. I had asked my body what my right shoulder pain was about. I received a very clear message: “Stop pushing, full stop.” I knew this meant not only that I needed to stop doing pushups, it meant that I needed to stop pushing in all areas of my life on all levels completely. No mental pushing, which was perhaps the most difficult. Just sit back, relax and be for awhile. I got the message loud and clear. I knew I was in trouble because it felt uncomfortable to brush my hair or even lift my purse. I had no pain whatsoever after going to a yoga retreat with Lillah Schwarz, but then I had to come home and carry a small bureau upstairs. That set it off again. I was out digging in my garden just this past weekend. I knew I had to tear out the old lantana in the front bed and take a shovel to work the soil to prepare for fall planting, and my guidance told me it had to be done then. Maybe somehow I knew I wasn’t going to be able to be doing any gardening for awhile. Then on Tuesday night while teaching yoga, I lowered myself to the ground – just once! It was the chaturanga to end the rest of my chaturangas for the next three weeks – at least! I felt this ripping pain through my right shoulder. I made a terrible face – and I am always encouraging my yoga students to relax their face, but this was a sharp, stabbing pain and I knew I was in trouble. Driving home from yoga class, I called a friend on my blue tooth to muscle test for me. I was in so much pain, I knew I was not in neutral and would not be able to get accurate information by trying to read the situation myself. I was afraid that I had hurt the bone, but my friend confirmed for me that I had injured my tendons, which attach muscles to the bone. This was still not good news, as connective tissue usually takes some time to heal. On Wednesday night, my friend Kathy Martin gave me a Reiki treatment. My friend Lee Townsend and I were spending the night at Kathy’s house before taking off on our long drive to Fairfield, Virginia, where we were planning to study natural vision improvement with my friend Don Wetsel, an acupuncturist and kinesiologist. I had packed all my belongings in small bags so I would be able to carry everything with my left arm without straining my right shoulder. Kathy got rid of the immediate pain, thank goodness, but my right arm still felt weak. Kathy, Lee and I had signed up to take Vision Circles, a class that I used to teach myself. I have taught the class and taken the class more times than I can even remember. I like to study it at least once a year to keep my eyes in good shape. I had been wearing cheater glasses since January, when I had to take over doing my own accounting. As you, dear reader, can possibly imagine, accounting is not my strong suit, nor is it my passion. I was terrified of making a mistake, so I found myself straining over my computer, holding my breath while I worked through Quickbooks, even though I know better than to hold my breath. I am human, after all. And with all that stress and strain, I found myself reaching for me $3 cheater glasses from Michael’s. It was almost like my brain could not see numbers without outside assistance from the glasses. Whether I liked accounting or not, I had no choice. I had to push through the discomfort of learning how to keep my own books. When we got to Don Wetsel’s office in Fairfield, he immediately did a healing on my shoulder. Although others who had worked with me had done a number of very helpful techniques – chiefly acupressure, stretching, posture correction and energy work – Don really got to the heart of the matter. He correctly identified the emotional issues involved and did more acupressure to correct the energy imbalances and clear the emotional roots. Kathy later did a quantum healing on it to speed the process from an energetic perspective. I cried for a bit the next morning. I was worried that I would not be able to do my job very well for the next three weeks, as Don confirmed for me what two other healers had told me – that I needed to do absolutely nothing with my upper body for at least three weeks to allow my shoulder to heal. That ruled out not only gardening but also a lot of yoga poses, all upper body weight training, body work that I usually do with my clients and countless other activities, like vacuuming, fixing my fountain outside and who knows what else. I am normally a very physically active person. Not even stretching, he told me. Just rest. The next afternoon Don brought out his jade Gua sha. This is a small, flat light green object that fits in the palm of your hand. A Gua sha tool is a brilliant way to eliminate inflammation. You take the jade Gua sha and scrape it along the affected area at a 30 degree angle until a small red patch appears. This helps the body release the inflammation and speeds the healing process. I worked on my shoulder myself. Then Kathy sat behind me in a chair and worked the jade Gua sha very thoroughly along all the affected areas, which were numerous. In previous healings, I found so many muscles and the corresponding tendons affected – the latissimus dorsi, subscapularis, the pectoralis major clavicular and pec major sternal, the pec minor, coracobrachialis, teres major and middle and lower trapezius – basically your complete meltdown picture for the shoulder. Then another friend, Linda Calman from Waxhaw, North Carolina, brought out an ointment from her acupuncturist and rubbed my right shoulder. The process was complete when she put five Chinese energy patches over the area. Gua sha comes from the Chinese words “cao gio” which literally means “catch the wind.” Excessive wind causes many illnesses, including colds, flu, pain, digestive disorders, headaches and fibromyalgia. Gua sha treatment is part of Chinese medicine but is usually considered a home treatment. The scraping creates a red mark, a portal for the “wind” to get out and removes stagnant chi and removes the heat of inflammation. I had already taken herbs for my heart and lungs to help my shoulder. I was out of natural antiinflammatories, but Kathy gave me a bottle of hers as a present. Don gave me Ligaplex to support the tendons. Various crystals are known to have healing properties, and jade is no exception. Jade qi and the body qi energy are closely related and complement each other. In previous days, Chinese doctors were rarely paid in money and created healing tools out of scraps of jade. I love jade and have a beautiful jade vase inside my front door. I have done classical feng shui on my home and enter through a doorway that is my best direction for optimal health. The first thing I see when I enter my home is this vase of serpentine jade, which includes all seven colors of jade and all the beneficial properties of jade, including long life, serenity, wisdom, moderation, peace, harmony and abundance. My Gua sha treatment felt relaxing. I could tell the pain was abating as circulation increased to the point where my entire right arm was tingling all the way down to my fingertips. Now, as I write this blog post, the entire area feels like it is slightly itching. I know I will have to avoid any lifting or pushing and be firm with myself in sticking with it. I knew I needed to stop pushing, quite literally, but I kept cheating and doing what had to be done. Now what needs to be done will have to wait. 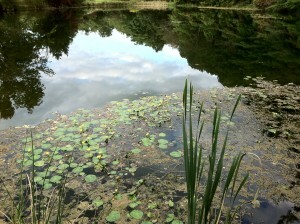 Photo: A pond in Fairfield, Virginia, where we practiced our natural vision improvement exercises.